Hey everybody! Can you believe it's exactly one month until Christmas?! It's approaching quickly and I still have a heap of cards and oodles of ideas to share with you before then! For today's challenge, I wanted to focus on a single layer background. 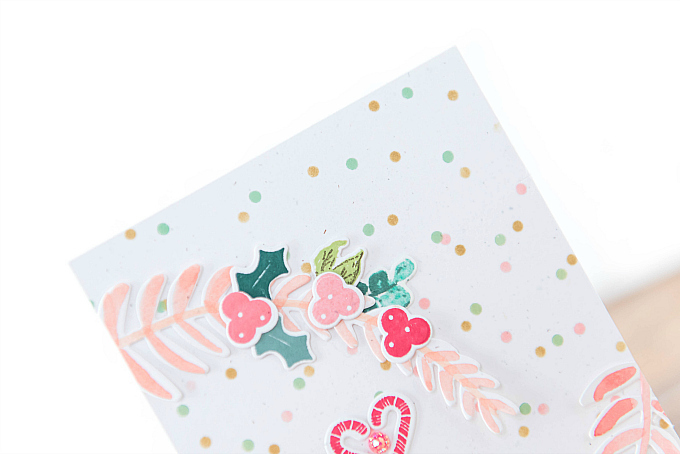 Plain cardstock seemed a little too vanilla, so I decided to make a dotted and festive one instead! I find this to be such a fun and relaxing technique. And the tools are so simple: just a stencil, an ink blender and some ink. I love the satisfaction I get when I peel back that stencil and reveal whats hiding beneath. It makes me smile every time! For this background, I used a polka dot stencil (here and here) and three colors of ink (Pale Peony, Saffron Spice, and Vintage Jadeite), alternating the stencil between them. I decided to only ink up every few dots or so, so that there was a bit more white space. For the focal pieces, I added Altenew's Floral Frame dies, watercolored with some soft peach strokes. I love, love, love these sweet branches - they are so versatile, and act as a perfect backdrop for adding berries, holly, leaves, and tucking in all sorts of trimmings :) Here I added sweet little bits from PTI's Holiday Hugs MIM kit in Pale Peony, Pure Poppy, Pinefeather, and Ocean Tides ink. The sweet candycanes are what inspired me from PTI's blog hop inspo photo! For the sentiment, I used PTI's Christmas Critters Sentiments stamps and added a wee candycane heart using Gingerbread Lane stamps and dies. Keeping things simple, I thought doing a mirror opposite of the branches would be just dandy! Another thing the PTI photo made me think of is a present tag! So I decided to make one, keeping things super simple again, adding only stamped florals and leaves with PTI's Bitty Blooms (discontinued, but similar here). I used colors of Pure Poppy, Ripe Avocado, Ocean Tides, Smokey Shadow, and Fine Linen. For the sentiment, I used Wplus9's Hand Lettered Holiday die and stamps and the tag base is PTI's Tag Sale #4 die. 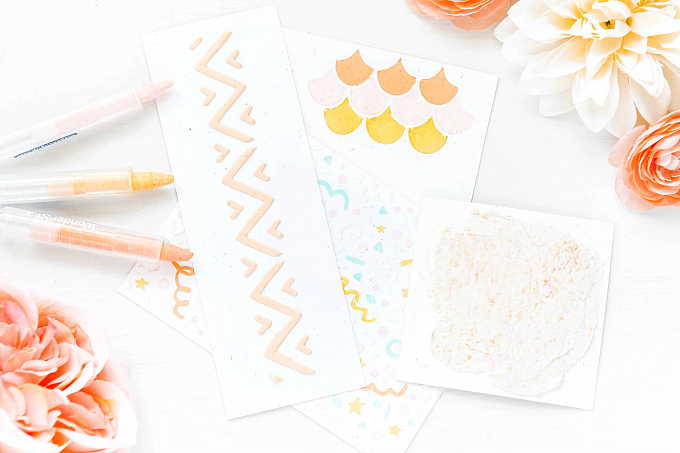 CAS is super hard for me, and if it is for you too, why not try easing in with this simple card background or quick tag! I hope you're getting a kick out of my CAS journey so far :) Thanks so much for visiting and for all of your sweet notes! Love your card, and your tag! That stenciled background is wonderful, and the floral frames make a perfect "frame" for your sentiment and candy canes. Ivana, I always love the soft look of your cards with the gorgeous colors. This is beautiful!! Aw, thanks Carmela! I so appreciate your visits! Ivana, this card is so pretty and delicate looking. Love the color choices and design. Just beautiful! Thanks, Lainey! You're too sweet! Wow.... two beautiful projects!! LOVE your fabulous color combinations and perfect detail! Love the soft pastels with a few touches of red! 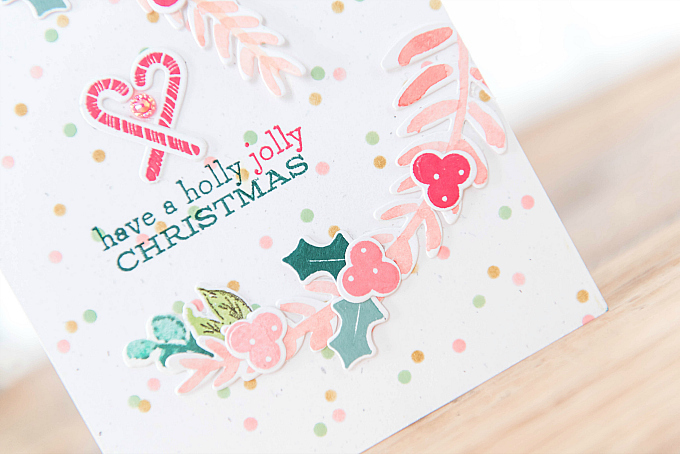 Lovely card and tag combination! 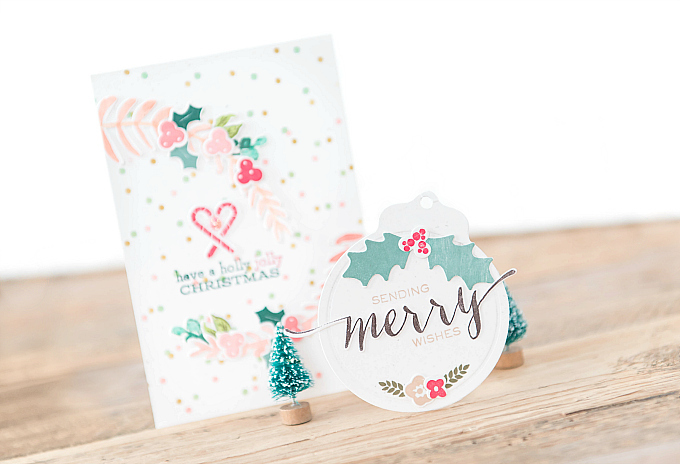 So pretty Ivana in the soft pale colors you used - love the dotted background and your layered branches and berries! Julia, I'm so glad you liked the details! I love polka dots - they're my favorite! Ivana this is beautiful! I love the dotted background and the fun, pretty colors. Lovely card and tag! Thanks a heap, Sharyn!! Sending hugs! Such a beautiful set! I especially love your soft colours—just super! Pretty dotted background & such a sweet, unique use of the inspiration, Ivana! Love the tag, too! I like all of your pretty little elements cascading down your card. And that candy cane heart is extra sweet! Your tag is cute too! Oooh, look at the color choices. Very pretty! I love your colour combination! And those dotes with that wreath. very pretty. Thanks so much, Annette! I so appreciate your sweet note! Just beautiful!! I love everything, colors, designs...all perfect!! Beautiful work Ivana! Gorgeous tag you coordinated too~there's so much love in your projects!!! Hi Ivana! Beautifully and softly layered perfection. Lovely coloring too! While I'm anything by CAS, I so admire anyone who does it well, and you mastered the carefully placed elements! Magical! What outstanding work! Your card and tag are sheer perfection. Brilliantly done. Cheers. Beautifully done, Ivana, and love how you mirrored the elements. 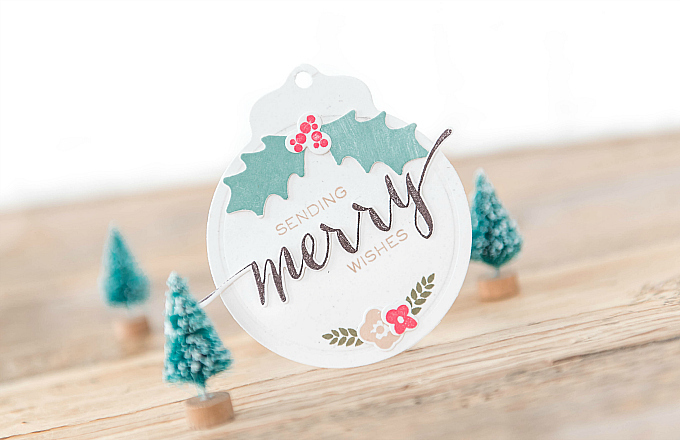 You stenciled background is so fun and festive with the three colors of polka dots and lots of white space. Adorable tag, too! Such a creative use of the inspiration, Ivana! Beautiful projects--love the colors! Thank you so much, sweet friend! I'm such a fan of PTI's blog hops! Their images always inspire me!